Rock and mineral kits are not only a fun toy for kids, they are a great learning tool. Geology is a great science for kids even at a young age. Rocks and minerals have beautiful colors, neat shapes, and interesting properties that are fun to study at any age. 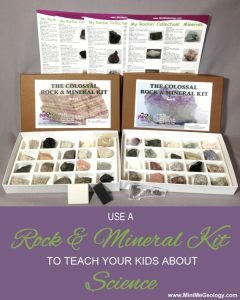 Here are a few tips on how to use your rock and mineral kit and family time together to help your child have fun with science. Provide children with simple rock and minerals kits that you can use together. Choose products geared toward their age group to keep their interest. Working with the kit together allows you time to show your kids why you think science is important and fun. Help your kids love science by looking for rock & mineral kits that will coordinate with school science projects and topics. Make learning science fun by showing children how science relates to their daily activities such as baking or the weather. You can show them how rocks are used to make counter tops, landscape materials and building tiles among others. Show your children the importance of science by caring for a garden, feeding the birds, collecting interesting rocks and recycling. Play a game with your kids on a nature walk. See how many varieties of rocks, minerals, plants and animals you can find and identify. Instill a sense of wonder in your children by showing them your own fascination with science and the world.Mini Me Geology has many rock and mineral kits for kids of different ages and interests. If you have questions about our kits or how to use them, contact us.